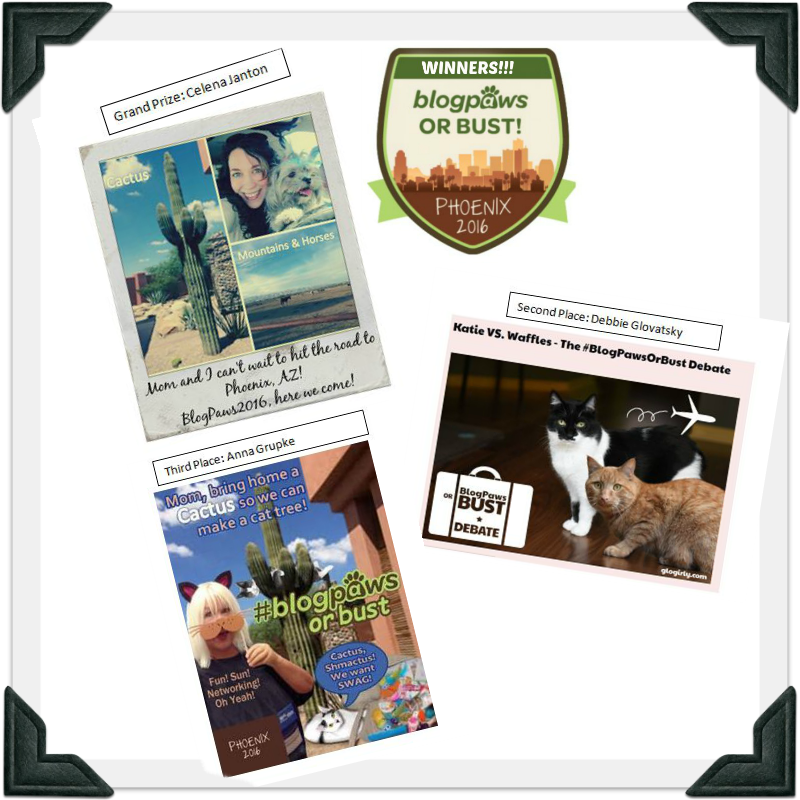 Enter the 2016 BlogPaws or Bust Contest NOW! Important: Please read these Official Rules before participating in the Contest. By participating in the Contest, you agree to be bound by these Official Rules and represent that you satisfy all of the eligibility requirements below. Entries. Entrants may only enter once. Duplicate entries will be disqualified. Entry Period: All entries must be received between 12:00:00 a.m. ET February 15, 2016 and 11:59:59 p.m. ET March 5, 2016 (“Entry Period”). Contest will include one round of judging beginning 12:00:00 a.m. ET on March 6, 2016 and ending on March 18, 2016 at 11:59:59 p.m. PT (“Judging Period”). Taking into account the judging criteria listed below, (i) write a description of a desert scene using at least four of the following keywords: cactus, mountains, trees, water, horses, hot, sunny, loud, excited, energetic, fun, hugging, shouting, nodding heads, pets, and bloggers; and (ii) include a description of you and your pet in the desert scene at the Conference at the Host Hotel. Each Entry, either image or written, must be legible, clear, include the blogger and the blogger’s pet. Second, submit the Entry by visiting the “BlowPaws or Bust Conteset” application found at http://blogp.ws/1O5nyZe (“Contest Application”) and click on the “Enter now” button. Complete the online registration form, including your name, address, location, and email address. You will be required to indicate your agreement with these Official Rules in order to complete your registration. Next, follow the directions to upload your Entry. Click the “Submit Entry” button to complete your Contest Entry. If you are submitting an image Entry, it must be in .jpg or .png format (maximum size limit of 1MB). In the case of a written Entry, a .doc, .docx, .pdf (maximum size limit 1MB) or a blog post link is acceptable. Limit one Entry per Contest Entry. Your “Contest Entry” includes your Entry, caption and your completed online registration form. Entries become the property of Sponsor and will not be returned. Entries and entrants may be subject to verification by Sponsor in its sole discretion. All entries must be in English. Any attempt by an entrant to post duplicate or near duplicate posts, will void such entrant’s entries and that entrant may be disqualified, and any potential Prize will be forfeited. Entries generated through a third-party website or software or in any way other than the manner and format set forth in these Official Rules is prohibited, and Sponsor reserves the right to disqualify any such entrant(s). By submitting an Entry, entrant warrants and represents that he/she owns the pet(s) that is/are featured in the Entry, has obtained permission from all persons in the Entry (or parent or guardian of minor children pictured), and that no images in the Entry infringe on another party’s intellectual property rights. Entrant agrees that the Contest Entities are not responsible for any unauthorized use of Entries by third parties. At any time during the Contest, even if the Entry has already been announced as a Prize winner, if Sponsor determines that an entrant’s Entry does not comply with any of the Official Rules, such Entry may be disqualified and will not be eligible to win a Prize. Contest Judging and Finalist Selection. During the Judging Period, a panel of qualified judges comprising representatives of the Contest Entities at Sponsor’s sole discretion (together, the “Judges“) will evaluate all eligible entries submitted during the Judging Period. Communicates messages or images inconsistent with the positive images and/or good will to which Sponsor wishes to associate. Examples include, pets in unsafe situations, or entries that promote bigotry or discrimination. Disparages any person, Pet360, BlogPaws, the Contest Entities or any such entity’s products. Contest Prizes. Three (3) prize packages will be awarded. Grand Prize: One (1) all expenses paid trip to the Conference in Phoenix, Arizona at the Host Hotel consisting of airfare for one (1) person, four (4) nights lodging at the Host Hotel, and one (1) full blogger registration to the Conference (up to a maximum of $1,500.00). Winner will be required to book his or her own airfare and will be reimbursed by Sponsor. Lodging at the Host Hotel and registration for the Conference will be purchased by Sponsor and given to the winner. Second Prize: One (1) prize package consisting of four (4) nights lodging at the Host Hotel and one (1) full blogger registration to the Conference (approximate retail value $945.00). Lodging at the Host Hotel and registration for the Conference will be purchased by Sponsor and given to the winner. Third Prize: One (1) full blogger registration for the Conference (approximate retail value: $229). Registration for the Conference will be purchased by Sponsor and given to the winner. Contest Winner Selection. Sponsor will attempt to notify potential prize winners on or about March 21, 2016 by sending an email to the email address provided on the Entry for entrants submitting via the Contest Application. Potential Contest winners may be required to execute and return an Affidavit of Eligibility for verification purposes or Liability/Publicity Release (TN residents need not sign publicity release) within three (3) business days. In the event of noncompliance with these Official Rules; if Contest Prize notification is returned as undeliverable; if the potential winner does not respond to Sponsor’s direct message within the Contest Period; or a Contest Prize winner declines Prize offered, the Contest Prize will be forfeited and Sponsor may select an alternate winner by random drawing from among all remaining eligible Contest Entries received during the corresponding Contest Period. Contest Prizes will be delivered within 6 – 12 weeks from date of verification via mail or freight to the street/mailing address provided by a winner in the Contest Application. Sponsor’s License to Entries. Each entrant grants to Sponsor, and its successors, assigns, licensees, representatives, agents, and those acting at Sponsor’s direction, a perpetual, irrevocable, royalty-free, non-exclusive, worldwide right and license to publish, reproduce, display, perform, distribute, adapt, edit, modify, translate, create derivative works based upon, and otherwise use and sublicense your Entry, or any portion thereof, in any manner, form, media or technology now known or later developed for any commercial or non-commercial purpose without your notice, review, or approval. Each entrant waives its moral rights, in the Entry, in favor of the Sponsor, and its successors, assigns, licensees, representatives, agents, and those acting at Sponsor’s direction. Each entrant agrees to take, at Sponsor’s expense, any further action (including, without limitation, execution of affidavits and other documents) reasonably requested by Sponsor to effect, perfect or confirm Sponsor’s rights as set forth above in this paragraph. Sponsor does not guarantee that all submitted Entries will be published. As a condition of submitting an Entry, each entrant acknowledges and agrees that (a) Sponsor and other participants have access to and/or may create or have created entries and/or other materials, ideas and concepts which may be similar or identical to the entrant’s Entry in theme, idea, format, characters and/or other respects; (b) the entrant will not be entitled to any compensation or other consideration because of the use by Sponsor or any other participant of any such similar or identical material, ideas and/or concepts; and (c) Sponsor’s or another participant’s use of material containing elements similar to or identical with those contained in the entrant’s Entry shall not obligate Sponsor to negotiate with and shall not entitle entrant to any compensation or other claim. ALL FEDERAL, STATE/PROVINCIAL AND LOCAL TAXES ASSOCIATED WITH THE RECEIPT OR USE OF ANY PRIZES ARE THE SOLE RESPONSIBILITY OF THE WINNER. All Prizes will be awarded. Prize notifications returned as undeliverable or otherwise not claimed within five (5) business days after delivery will be forfeited and will be awarded to an alternate winner. Prizes are not transferable. No substitutions or exchanges (including for cash) of any Prizes will be permitted, except that Sponsor reserves the right to substitute a Prize of equal or greater value for any Prize. Limit one (1) Prize per person, household or address. All Prizes are awarded “AS IS” and WITHOUT EXPRESS OR IMPLIED WARRANTY OR CONDITION OF ANY KIND (including, without limitation, any implied warranty of merchantability or fitness for a particular purpose). Sponsor is not responsible for loss, delay or damage in shipping any Prize or notification. Identity of Entrant. In the event of a dispute over the identity of an online entrant, Entry will be deemed submitted by the authorized account holder of the e-mail account of the e-mail address submitted at time of Entry. “Authorized account holder” is defined as the natural person who is assigned to an e-mail address by an Internet access provider, on-line service provider, or other organization (e.g., business, educational institution, etc.) that is responsible for assigning email addresses for the domain associated with the submitted e-mail address. A potential Prize winner may be required to provide Sponsor with proof that the potential Prize winner is the Authorized Account Holder of the e-mail address associated with the winning Entry. General Release. By entering this Contest, you release Sponsor, and all Released Parties, from any liability whatsoever, and waive any and all causes of action, related to any claims, costs, injuries, losses, or damages of any kind arising out of or in connection with the Contest or delivery, misdelivery, acceptance, possession, use of, misuse of or inability to use any Prize (including, without limitation, claims, costs, injuries, losses and damages related to intellectual property, personal injuries, death, damage to or destruction of property (including your pet), rights of publicity or privacy, defamation or portrayal in a false light, whether intentional or unintentional), whether under a theory of contract, tort (including negligence), warranty or other theory. Use of Entrant Name, Likeness, etc. Except where prohibited by law, by submitting an Entry, you hereby consent to Sponsor’s use of the Entry in its internal communications and publications and on social media and other marketing platforms. You also confirm that any people and/or the owners of any animals who are featured in the Entry gave permission for you to take the image(s) and do not object to your and Sponsor’s use of the same for commercial purposes. Winner List; Rules Request. For a copy of the Contest Prize Winner list, visit www.blogpaws.com or send a stamped, self-addressed, business-size envelope by March 31, 2016 to “BlogPaws or Bust Contest” Winners’ List at 2260 Butler Pike, Suite 100, Plymouth Meeting, PA 19462. To obtain a copy of these Official Rules, visit http://blogpaws.com/blogpaws-or-bust-2016-official-contest-rules or send a stamped, self-addressed, business-size envelope to “BlogPaws or Bust Contest” Official Rules at 2260 Butler Pike, Suite 100, Plymouth Meeting, PA 19462. Residents of VT may omit return postage. Miscellaneous. The Contest and these Official Rules will be governed, construed and interpreted under the laws of the state of Arizona, U.S.A., without regard to conflict or choice of law provisions or international treaties or conventions. Entrants agree and consent to exclusive jurisdiction and venue of the federal and state courts located in Maricopa County in the State of Arizona, U.S.A. Entrants agree to be bound by the Official Rules and by the decisions of Sponsor, which are final and binding in all respects. Sponsor reserves the right to change the Official Rules at any time and for any reason, in its sole discretion and without notice, and reserves the right, for any reason, to suspend or cancel the Contest or any entrant’s participation in the Contest including should viruses, bugs, unauthorized human intervention or other causes beyond Sponsor’s control affect the administration, security, fairness or proper play of the Contest, or Sponsor otherwise becomes (as determined in its sole discretion) incapable of running the Contest as planned. Entrants who violate the Official Rules, violate any law, rule or regulation in connection with participation in any Contest, tamper with the operation of the Contest or engage in any conduct that is detrimental or unfair to Sponsor, the Contest or any other entrant (in each case as determined in Sponsor’s sole discretion) are subject to disqualification from Entry into the Contest. Sponsor reserves the right to lock out persons whose eligibility is in question or who have been disqualified or are otherwise ineligible to enter the Contest. Any provision of the Official Rules deemed unenforceable will be enforced to the extent permissible, and the remainder of these Official Rules will remain in effect. If you have any questions about these Official Rules or the Contest, please mail them to BlogPaws or Bust Contest at 2260 Butler Pike, Suite 100, Plymouth Meeting, PA 19462. Contest Sponsor: Pet360, Inc. 2260 Butler Pike, Suite 100, Plymouth Meeting, PA 19462.